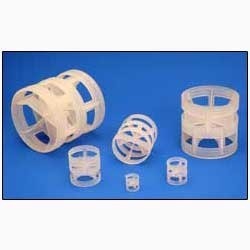 We offer our patrons a huge assembly of Plastic Pall Rings that are widely used for various industrial applications such as in manufacturing of towers absorption, stripping, scrubbing as well as for other separation applications. These balls are widely acclaimed at international level, owing to cylindrical dimensions with web moved into the center which escalates the performance, efficiency along a drop in pressure. Moreover, its capacity versus pressure drop is suited high capacity and low pressure drop applications.